In November 2003 a few of us started a Walking Bus scheme at our local primary school to reduce traffic and encourage more children to walk to school. (A Walking Bus isn’t really a ‘bus’ – it’s when children walk to school in an organised group and parents take turns to help). At that time it was very difficult to get practical information on the schemes. After seeing the success of our own Walking Buses we set up an information website to help to other parents who were interested in starting a walking bus at their own child’s school. We teamed up with local partners such as Northamptonshire County Council and Northamptonshire ACRE and visited schools to help get more walking bus schemes started in our local area. Since then we have been providing information about a range of walk to school schemes and related practical issues through our website. Our information is intended to supplement the support provided by local authorities and is written very much from a parent’s point of view. 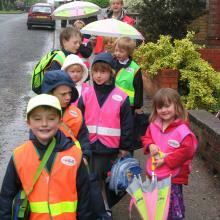 On a Walking Bus children wear fluorescent, reflective (high vis) waistcoats. This not only makes them more visible to drivers but also makes group monitoring easier. It is also an insurance requirement on some kinds of walking bus. Seeing the children look so bright made us realise the jackets could be used by other children when cycling, or out on a school trip, especially in low sunlight, mist or rainy weather or after dark. Some of the local children were unwilling to wear the adult-size industrial style high vis which had been donated for our walking bus. So we started a school design club and worked with the children to develop more exciting styles using different fluorescent colours, trims and coloured reflective tape. They also helped us to develop ideas for fun high vis badges, bags, accessories and a logo… we realised it would be great for them to have themed stickers, badges and other incentives to encourage or reward them for taking part in walk to school initiatives. Being able to maintain and expand our information services for parents about starting walk to school schemes was a challenge financially. However, we realised by developing and selling products to support these schemes we would be able to earn the income we needed to fund our activities. We found assistance with manufacturing the waistcoats and other products, set up as a social enterprise worker co-operative and launched Brightkidz in 2004. By offering products related to our aims we were able to make Brightkidz financially self-sustaining and fund further development of our information resources. Nowadays the waistcoats are most popular with schools for taking children out on class trips as they help with group monitoring. Although we still are mainly known by our name Brightkidz, our range has vastly expanded to include many items to promote all kinds of safe, active travel for all ages… not just bright things for kids. Social Enterprise – What Does This Mean? You’ve probably heard of other social enterprises: the Eden project, Jamie Oliver’s ‘Fifteen’ restaurants and the Big Issue. A social enterprise is a business which solves a social problem and is not set up for the purpose of making a profit. However, it has to make a profit in order to carry on – the difference is the profit is ploughed back unlike ‘for profit’ businesses which have to pass profit on to investors. We decided to set up Brightkidz as a social enterprise as, unlike many charities, we had a way of earning income which supported our aims, making us financially sustainable. There are many different legal structures for social enterprise. Although Brightkidz is our trading name, Safe Kids Walking Ltd is our legal name – a ‘company limited by guarantee without share capital’. It is part of the common ownership movement, is asset locked and therefore cannot be sold for personal profit. There are no owner directors receiving dividends but all staff are paid a salary. In line with our constitution any excess income is ploughed back or used towards schemes to promote walking to school, road safety initiatives and active lifestyles. Worker Co-operative – What Does This Mean? Brightkidz/Safe Kids Walking Ltd is also a worker’s co-operative which means all employees have a say on how the business is run and we are guided by the seven co-operative principles. Brightkidz founder Alison Holland with Phil Smith of Derbyshire County Council and Kevin Croasdale of Living Streets. Although our own children are older and no longer need the walking bus, we are now even more involved in promoting safe, active, sustainable travel to school through our customers and partners. We work with school travel professionals and schools to develop more resources. 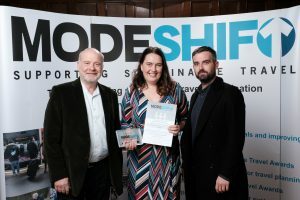 Our founder Alison Holland was awarded the ‘Individual Contribution to Sustainable Travel’ award by Modeshift, the national body for sustainable travel professionals in the UK. The award was sponsored by Living Streets the charity behind the UK national Walk to School Week campaign. Social media has given us a new way of engaging with others to gather and share resource ideas. We actively post and share many initiatives to help inspire others. The Social Value Act means local authorities are now being encouraged to look at the full value and impact of their buying decisions. By buying from social enterprises money spent is staying in the sectors which serve people. However, local authority budget cuts mean many schools need to look elsewhere to fund their resources to promote safe, active, travel. Our latest scheme, ST:EPS ‘Safer Travel: Enabling Primary Schools’ which we are currently piloting in partnership with our own local authorities is about helping schools make the most of limited resources and connecting them with businesses to get support through sponsorship.